Green lacewing adults are soft bodied insects about 2/3- to 3/4- inch long with four delicate membranous wings with numerous crossveins providing the insect’s lace-like appearance. 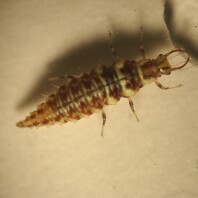 While a few species of green lacewings are predacious as adults, the larvae are nearly all predacious and very common. 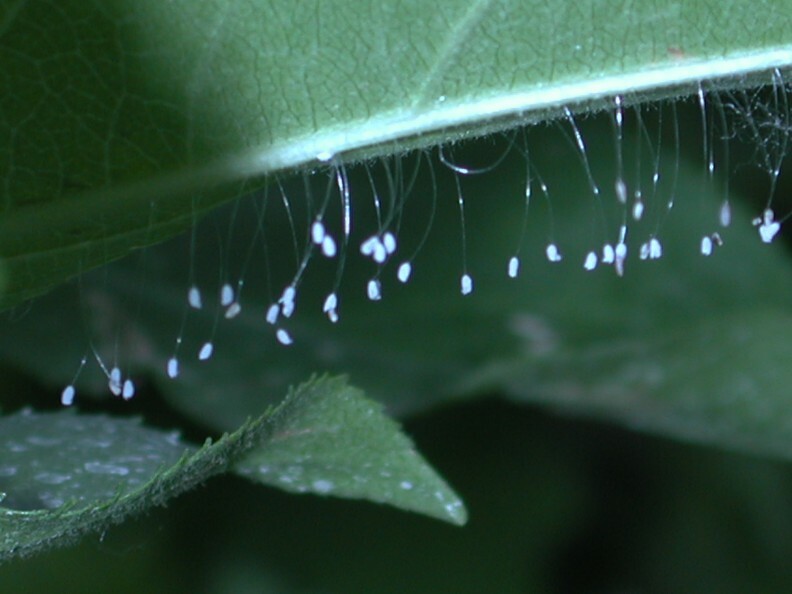 Green lacewing eggs are rather unique and easy to recognize. The egg is a green to white capsule less than 1/32 inch suspended by a long thread (1/4-inch long) typically found on the underside of vegetable plant leaves, laid singly and in clusters. 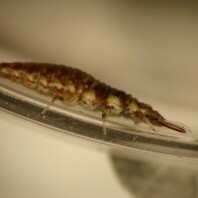 Each green lacewing larva has a flattened, alligator-shaped body (body length ranges from 1/16 to 2/3 inches long) with formidable set of mandibles that makes it an excellent predator of small insects. These larvae, sometimes called aphidlions, are mobile and will stalk and grab their prey with their mandibles. Prey: The larvae of green lacewingsare common predators in vegetable crops that feed on aphids, scale insects, leafhopper, mealybugs, psyllids, small caterpillars and insect eggs. Antonelli, A. L. 2003. Green lacewing. WSU Puyallup Research And Extension Center. Berry, R.E. 1998. Green Lacewing, Neuroptera: Chrysopidae, Chrysopa spp. Insects and Mites of Economic Importance in the Northwest. Curtiss, R and S. Booth. 2007. Green lacewings. In Tree Fruit Research & Extension Center Orchard Pest Management Online.